These hot summer days will be an excellent occasion for doing something that requires some heat...namely wine brewing. The last attempt at brewing tropical fruit wine was ruined by a flood incident in my old apartment...it is time to try again. and of course a few months. I am really looking forward to starting with this. 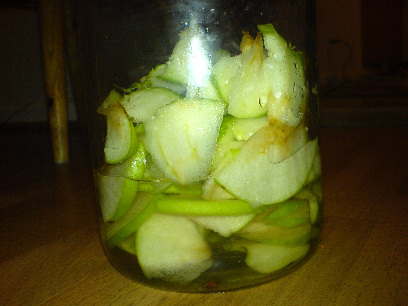 In a few weeks, this will hopefully be tasty green apple liquour! Hard part will be distilling it, I would use a pot distiller because it tends to retain most of the flavor of the mash (Or so I hear). Anyways, good luck and I hope it is palatable. ^ Great site where I learned a lot about stills. the good thing with this kind of recipe is that it doesn't need to be distilled the fruit is soaked in strong alcohol, and only needs to be strained later before i add extra sugar. the alcohol in the mix forces the juice out of the fruit. Both my mother and my sister-in-law have now started fruit wines. They are running a competition on who gets the strongest wine...so my father and me will also join it. The instructions say that the wine could finish fermenting in as little as one week. We will see how that goes. As for the liquour, it seems to be done now. We only need something to strain it properly with before adding sugar and eventual citric acid. *blopp* yes, it is certainly fermenting. The liquour was strained today, sugar was added and it looks and tastes well! Another kg of sugar was added to the wine today. The fruit was removed from the wine today, and some extra sugar added even if that isn't in the recipe. Removing fruit from wine is a messy job, it has to be strained through cloth. To get as much juice as possible out of the fruit, it has to be twisted just like wet laundry. The wine has stopped fermenting and has cleared well. Now it only has to be siphoned into another wine balloon before it is finished in theory. Of course, wine will always taste better after some rest.